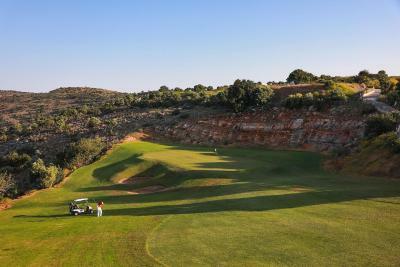 Lock in a great price for Crete Golf Club Hotel – rated 9.4 by recent guests! Luxurious, spacious, veryclean rooms, friendly staff. 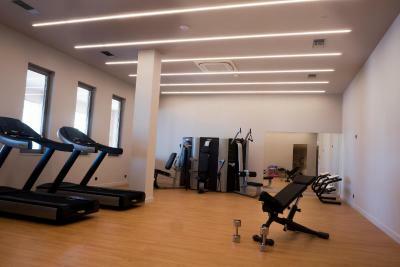 Great gym and golf facilities. This was a wonderful place to stay! Very kind staff, beautiful rooms and fantastic food!! The chef is excellent. 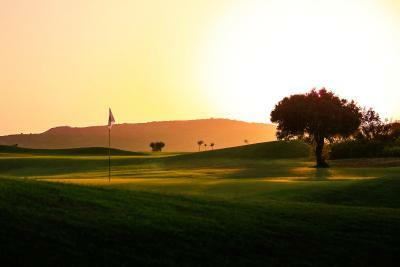 Also the golf course is very beautiful and in a fantastic shape! High standard, clean and spacious rooms, excellent breakfast with a great service, perfect location to start a roundtrip in Crete. Pool area very beautiful. Location very quiet and with a nice view towards the mountains. 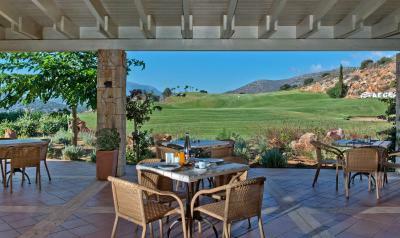 Great breakfast with a view of the course. Also healthy options for sporty people. The whole staff is very friendly and helpful. We never felt uncomfortable because of our two little children. The opposite...they always tried to make them happy ( e.g by checking when the court in front of the restaurant was free to allow them to run and play safely or fill up my youngest boy's feeding bottle with milk every time we need it! ). Every evening we could discuss directly with the chef what we would like and how to be cooked or prepared. But I am sure that everything starts from the leader of the team, the manager of the hotel Mr Nicholas Spiropoulos. A very humble, pleasant and interesting person that spends enough time with each client listening of their needs and socializing, but definitely not excessively. Really nice house with a few spacious appartment, excellent kitchen, good bed and a nice view of the sea from the balcony. Host was very friendly and helpful (we arrived around midnight); beach approx. 10 minutes away by foot but lots of nice beaches around easy reachable by car (parking space in front of the house). Location is a very good starting point to explore Chania and the entire west of Crete. We were really impressed with our suite, probably the nicest hotel room we've stayed in. 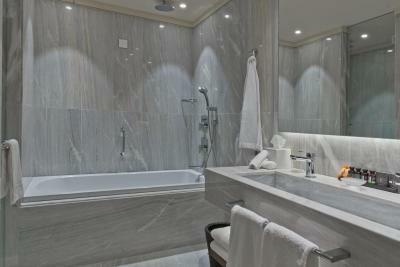 The bathroom was stunning, with a lovely big bath and a fantastic walk in shower. Our bed was huge and very comfy. Breakfast was incredible every morning, you really were spoilt with all the fresh bread, fruit, yoghurts, cheeses etc. You could also have eggs made for you, however this wasn't actually clear and the only reason I knew about it was that I had read a review saying the exact same thing. A sign would be good, or to be asked when you sit down. I absolutely loved this hotel - so relaxing! The food was great, the nicest rooms around and great value for money! 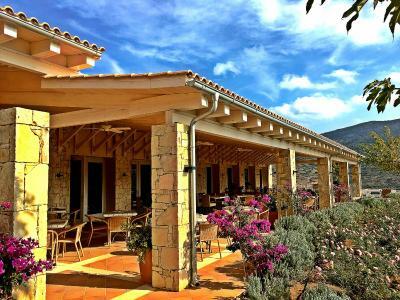 Crete Golf Hotel is the perfect hotel for a relaxing break, beautiful rooms, immaculately clean with views of the mountains & sea, great facilities, air con, coffee & tea selection, mini bar, large flat screen tv, rainfall shower & bath. Eating breakfast on the terrace overlooking the 18th hole was a great start to the day, also a lovely area for lunch & snacks. The infinity pool is beautiful plenty of sun loungers, parasols & towels a relaxing area to pass the time away The greatest asset of this hotel is the staff, they were all so friendly & helpful always on hand if you needed anything, it was a delight to see them after a busy day sightseeing. I look forward to a return visit. 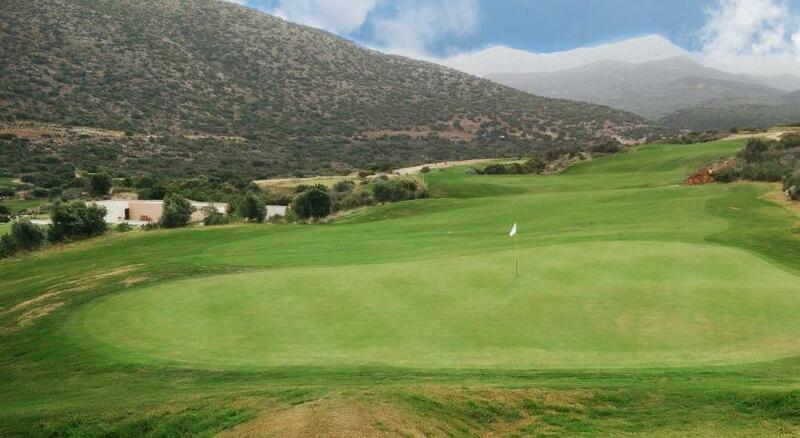 Crete Golf Club Hotel This rating is a reflection of how the property compares to the industry standard when it comes to price, facilities and services available. It's based on a self-evaluation by the property. Use this rating to help choose your stay! 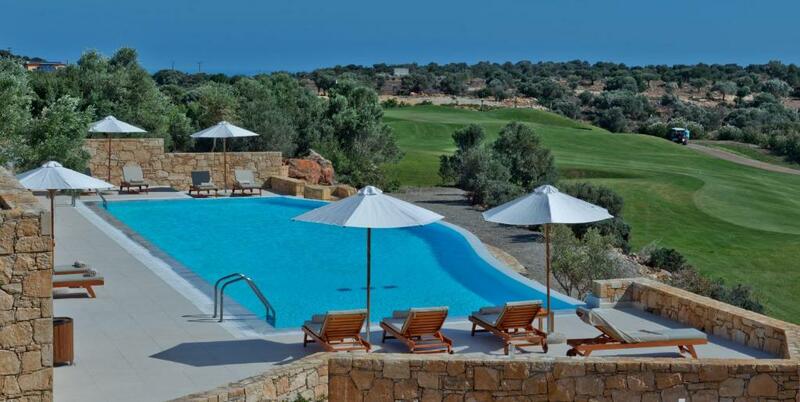 Crete Golf Club Hotel is located at The Crete Golf Club, an 18-hole Championship course in Hersonissos, 1.1 mi from Aquaworld Aquarium and features a seasonal outdoor swimming pool. 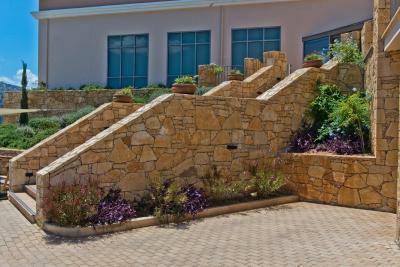 1.2 mi from Labyrinth Park, the hotel features a fitness center and a garden. The restaurant serves European cuisine. All units in the hotel are fitted with a flat-screen TV. Rooms have a private bathroom with a bath, private ultra high speed WiFi, free toiletries and a hairdryer. 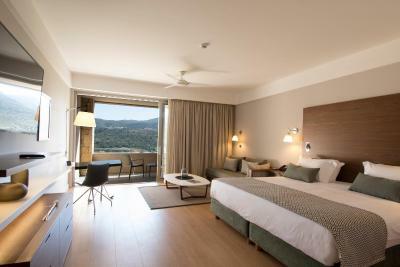 The rooms at Crete Golf Club Hotel come with a seating area. 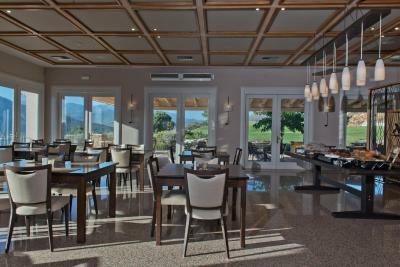 A à la carte breakfast is available daily at the property. Water City is 1.4 mi from the accommodations. 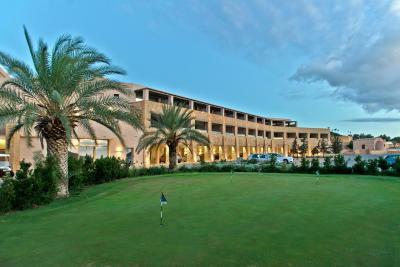 The nearest airport is Heraklion International Airport, 11 mi from Crete Golf Club Hotel. 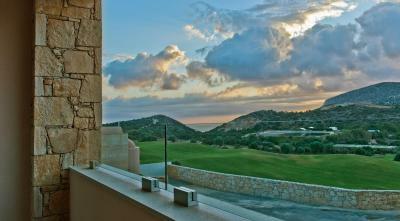 When would you like to stay at Crete Golf Club Hotel? This double room has a balcony with mountain and sea view, seating area, in room private ultra high speed WiFi and satellite TV. This double room features a balcony with mountain and sea view, in room private ultra high speed WiFi, mini-bar and soundproofing. 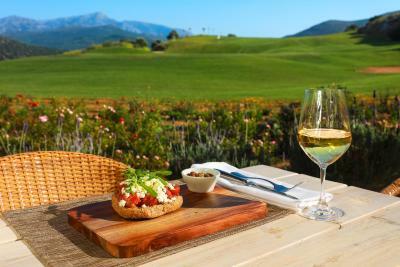 House Rules Crete Golf Club Hotel takes special requests – add in the next step! Crete Golf Club Hotel accepts these cards and reserves the right to temporarily hold an amount prior to arrival. Kitchen closes at 20:30 (although you can still order if you are already there). No room service. A place for children, a crèche like thing or kids club, so both children can be entertained safely and in a creative way, and parents can have more relaxed time and being able to spend more time in the greens. Worse breakfast and dinner we’ve ever had. Amazing large rooms! Great staff! We found the lunch menu to be limited, and had the same sandwich every day for 9 days, one day the very accommodating head chef made us something a little different. This was the same for dinner. We had paid for half board but, again, found the menu limited, particularly as a vegetarian. The head chef however was very keen to produce different meals for us and I feel that he should be given more opportunity to change the menu of an evening. 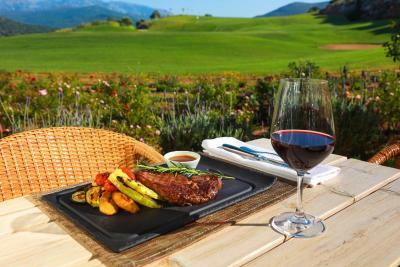 It's clear that the menu has been set for golfers who dine at the club occasionally, not for hotel guests who want to eat there regularly or who have paid for a half board service. We felt extremely short changed by this and as a result, only ate 5 times out of 10 nights in the hotel, despite paying for half board. The restaurant also closes quite early (as golfers finish playing by 8pm) and therefore food wasn't available to us when we arrived at the hotel (or anytime after 8:30pm), which isn't ideal, particularly as the nearest restaurant is around a 10 minute drive away and not possible to walk to. We found the majority of the staff to be fantastic, a special mention to the receptionist with the blonde hair, the golf specialist, the head chef and our waitress. However we did have two issues which marred our experience. On our last day, we had an incident in our room and when we spoke to the general manager about it, he was extremely defensive over it and implied that it was our problem and not a problem with the hotel or its staff. We came to him with constructive criticism and advice and although he did look into the incident for us, he made us feel like we wanted something for free which was most definitely not the case and rather insulting. We also had an issue when checking out when the receptionist told us our room bill was 2500 euros even though we had pre-paid for our room. The receptionist didn't believe us and we had to show our bank statement to prove ourselves which was pretty mortifying. During our stay the kitchen stopped at 19.30 because of few guests, so we had to go in to Hersonissos to eat a couple of nights. Superb breakfast, one of the nicest bathrooms I have seen and lets not forget about the beautiful golf corse! Excellent hotel. 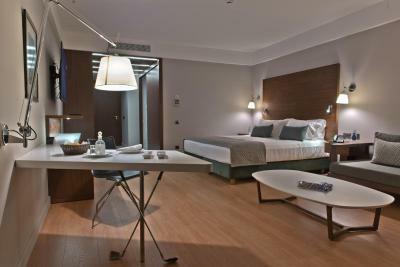 Large room, modern bathroom facilities, extra large bed, giant LED TV. Pool is also nice and the general area/atmosphere and the views are fantastic. The staff was very kind and helpful. The restaurant offered very good food at quite reasonable prices.